Production: Paramount Pictures; color, 35mm, Panavision; sound: mono; running time: 143 minutes. Filmed in Beirut, Lebanon, Miami, Florida, and Oregon. Producers: Robert Evans, Alan Levine (associate), Robert L. Rosen (executive); music: John Williams; cinematograper: John A. Alonzo; editor: Tom Rolfe; casting: Lynn Stalmaster; sound: Howard Beals, Gene S. Cantamessa, John Wilkinson; special effects: Logan Frazee, Gene Warren, Jr.; stunts: Everett Creach, Howard Curtis; art direction: Walter H. Tyler; set decoration: Jerry Wunderlich; costume design: Ray Summers; makeup: Sugar Blymer, Bob Dawn, Brad Wilder; production manager: Jerry Ziesmer. Cast: Robert Shaw ( Kabakov ); Bruce Dern ( Lander ); Marthe Keller ( Dahlia ); Fritz Weaver ( Corley ); Steven Keats ( Moshevsky ); Bekim Fehmiu ( Fasil ); Michael V. Gazzo ( Muzi ); William Daniels ( Pugh ); Walter Gotell ( Colonel Riaf ); Victor Campos ( Nageeb ); Joseph Robbie ( Himself ); Robert Wussler ( Himself ); Pat Summerall ( Himself ); Tom Brookshier ( Himself ); Walter Brooke ( Fowler ); James Jeter ( Watchman ); Clyde Kusatsu ( Freighter ); Captain Tom McFadden ( Farley ); Robert Patten ( Vickers ); Than Wyenn ( Israeli Ambassador ); Jack Rader ( Pearson ); Nick Nickolary ( Simmons ); Hunter von Leer ( T.V. Cameraman ); Sarah Fankboner ( V.A. Receptionist ); Kathy Thornton ( Head Nurse ); Frank Logan ( Lansing ); Frank Man ( Desk Clerk ); Kenneth I. Harms ( S.W.A.T. Captain ); Kim Nicholas ( Girl Hostage ); Bert Madrid ( Bellhop ); Ian Bulloch ( Secret Service Agent [uncredited]); Michael J. Reynolds ( Jackson ). Pratley, Gerald, The Cinema of John Frankenheimer , New York, 1969. Pratley, Gerald, The Films of Frankenheimer: Forty Years in Film , Bethlehem, Pennsylvania, 1998. Drew, B., "John Frankenheimer: His Fall and Rise," in American Film (Washington, D.C.), vol. 2, no. 5, March 1977. Hansard, B., "Creating Front Projection Effects for Black Sunday ," in American Cinematographer (Hollywood), vol. 58, no. 8, August 1977. Black Sunday was produced in the wake of the Arab-Israeli conflicts of 1967 and 1973. Within the conventional limits of Hollywood storytelling, the film treats intelligently the relationship between political turmoil in the Middle East and the advent of international terrorism on a broad scale, one of the most significant developments of the era. Black Sunday thus connects more meaningfully to contemporary historical events than the ordinary American commercial film. Director John Frankenheimer offers a nightmare version of what might result from the despair of radical Palestinians at the increasingly bleak prospect of any conventional military or political settlement of their claims for repatriation and statehood. Deciding to launch a campaign of terror against the American people so that the rich and politically settled can, in the words of their leader, "share the pain of the Palestinian people," members of a Black September cell plan to kill everyone present at the Super Bowl football game. In this plot they are nearly successful. 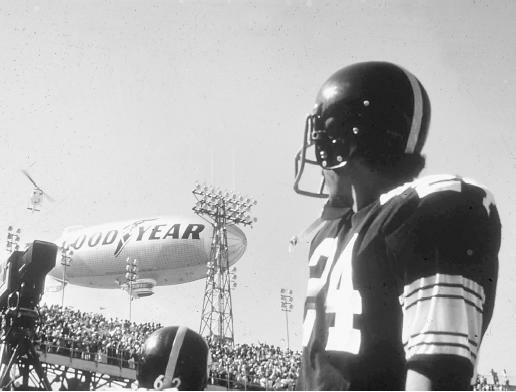 Aided by a Japanese fellow traveler, who supplies the necessary explosives, and a disaffected, perhaps insane former American soldier, who acts as their pilot, the group arrange to hijack the Goodyear blimp, normally used to help broadcast the game, load it with a bomb composed of plastique and a quarter million steel darts, and explode it directly over the stadium in the expectation that the vast majority of the eighty thousand spectators will be cut to ribbons. Opposing them are agents of an Israeli anti-terrorist unit and the CIA. In a spectacular conclusion, the blimp is intercepted by police helicopters just before its arrival over the stadium. After the terrorists are killed, the blimp, with the fuse of the bomb burning down, is barely towed out to sea before it explodes, harmlessly. entertainment, in the midst of America's most sacred secular event? And what could be more typical of the mainstream thriller than for this well-calculated plot, artfully sustained by a series of reversals, to end, mano a mano , with the courageous protagonist defeating his enemies by guile and strength in order to save a faceless multitude? Though ably supervised by Frankenheimer, these requisite action sequences were not of the greatest importance to a director, who, in the manner of a social realist, was obviously more interested in examining the cultural and political forces that have shaped the main characters in the drama. In this way, Black Sunday is typical of Frankenheimer's films. Only when the industry changed did he abandon his work in television, a distinguished career, in fact, directing prestigious live drama (including adaptations of Hemingway's The Fifth Column , The Snows of Kilimanjaro , and For Whom the Bell Tolls ). Frankenheimer quickly made a name for himself in Hollywood with finely detailed studies of unusual or complex characters: the would-be gigolo and his admiring brother in All Fall Down ; the violent convict who becomes an ornithological expert in The Birdman of Alcatraz ; the aging businessman who seizes the opportunity to abandon the identity which now wearies him and begin life anew in Seconds. Unlike the big budget spectaculars of the period, these "adult" films (normally in black and white), and those of others from the so-called "New York School," depended on literate scripts, nuanced performances, careful editing, and restrained yet effective cinematography. Frankenheimer also specialized in political thrillers. His The Manchurian Candidate , The Train , and Seven Days in May , the best of a consistently distinguished body of work in the genre, are acknowledged masterpieces. Political thrillers of the Hollywood variety commonly suffer from an overemphasis on action, onedimensional characters, and a melodramatic opposition of absolute good to absolute evil that simplifies the political conflict. Frankenheimer's thrillers, in contrast, are structured around a protagonist of divided loyalties who, though he finally chooses the "right" side, does so only with difficulty. The Train 's resistance leader, a railroad man of no culture, must come to share, in order to defeat him, the views of an educated Nazi officer, a cold-blooded aesthete who thinks that the French art treasures he is stealing are worth the sacrifice of many lives. In Seven Days in May , an army officer who discovers a coup planned by high-ranking generals must betray them in order to remain loyal to his oath to the president and country. Black Sunday offers similar moral complexities. The film opens with a sequence devoted to the Black Septembrist leader, a woman (Marthe Keller) whose family, we later learn, has been destroyed in the region's wars. She meets with others of her cell in Beirut to plan the attack on the United States, and the group that night is attacked and nearly wiped out by a group of armed men who are later revealed to be Israeli agents. The attack finds the woman in the shower, and the commando leader (Robert Shaw), though he sees her there, cannot bring himself to shoot. This act of reflexive humanity allows the plot to go forward. The Israeli leader, tracking the terrorists to the United States, confesses to his younger colleague that he is no longer able to kill in the hopes of changing a situation that, during his professional life, has never changed in the least. But then his young colleague is killed by the very woman that he had allowed to live. When the two antagonists again come face to face, she, ready to go up with the blast, is in the stadium-bound blimp, while he is in the pursuing helicopter. As they recognize each other, he does not hesitate this time, killing her with a burst from his submachine gun. His act, however, cannot be seen simply an act of revenge, for the woman's death does not end the threat. Only by having himself lowered to the blimp can the commando leader affix the tow rope so it may be pulled out to sea. In the end, he is motivated as much by the urge to preserve as he is by his habit of destroying. With its richly detailed evocation of place and political context, Black Sunday makes convincing and affecting what might otherwise be a somewhat cartoonish central gimmick, somewhat reminiscent of similar elements in James Bond films of the 1960s and 1970s. There is, after all, little difference between the Black Septembrist plot to use a dart-loaded blimp to turn the Super Bowl into a massacre and, say, Goldfinger's attempt to vaporize the gold in Fort Knox and create a world financial crisis. Finely coached performances by Shaw and Keller dominate the film, while Bruce Dern is also effective as a disgruntled Vietnam vet eager to get his own back. The film does not endorse either Palestinian grievance or Israeli attempts, often brutal, at pre-emptive self-defense; instead, it invokes the sad inevitability of Middle Eastern conflict, now played out in the open spaces and society of a self-satisfied, smugly fun-seeking America. The terrorists' plot, once discovered, might easily be foiled by a decision to cancel the game, but this proposed course of action is quickly dismissed by the officials in charge, though the president does change his plans to attend. The spectators in the stadium are thus saved through the working out of an international drama high above them of which they are completely unaware, the final irony in Frankenheimer's masterful thriller.